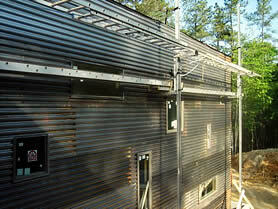 The Ehrlich House is a custom prefab home near Chapel Hill, NC, designed by architect Dustin Ehrlich. The majority of the work was done in the factory, reducing on-site construction time on this 3200 ft2 home to approximately four months from building permit to move-in date. The home is thoroughly modern in form and function, but finished with materials meant to relate to the area's rural vernacular. An eclectic material palette of stone, wood, stainless steel, and rusted corrugated metal finish the exterior. Inside, space flows through the open floor plan—visually (through walls of glass) and literally (opening onto patios, a partially-enclosed courtyard, and a large roof deck above the garage). Views of the nearby forest are framed though smaller windows, strategically placed in the walls based on the function of the rooms. The home was completed in July 2007, and as of August 6, 2007, there were boxes everywhere :) Construction photos of the house can be viewed on the images page.